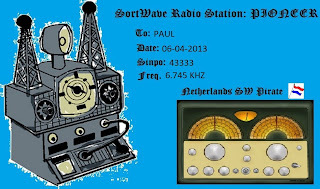 6425-20.52 Radio Tidalwave With Music From Rozalla"everbodys free". Good Signal Sinpo 43444. Closed Down After Song Had Finished. 6285-16.55 Unid With Music From Soul Sister And The Hollies. Also Some Dutch Music. Fair Signal Sinpo 43333. Maybe Radio Osaka. 6300-17.18 Unid With Dutch Music And BZN. Fair Signal Sinpo 43333. 6305-20.05 Radio Merlin International with Music From Julian Cope, Thin Lizzy And Motorhead. Strong Signal Sinpo 54444. Good To Hear Them Back On SW.
6250-19.20 Radio Tina With Instrumental Music, Weak Signal, Odd Fair Peak Sinpo 33233. 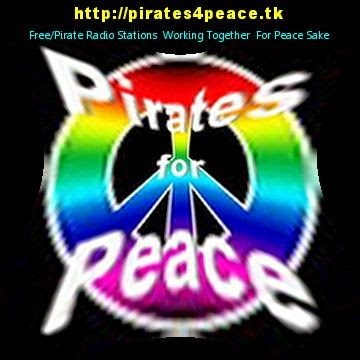 6287-15.30 Radio Pandora Playing Oldies Including The Christians And Tony Christie. Also Id Jingles. Fair Signal Sinpo 43333. Nice To Hear This Station On A Saturday Usually Comes On A Sunday. 3932-23.10 High Energy With A Relay Of A American Free Radio Program. Good Signal Sinpo 43444. 19.00 to 20.00 UTC on 1485 kHz via R Merkurs in Latvia with a weekly separate programme. 6280-8.28 Cosmic Radio With Ambient And Alternative Music. Also Id Jingle. Good Signal Sinpo 43444. 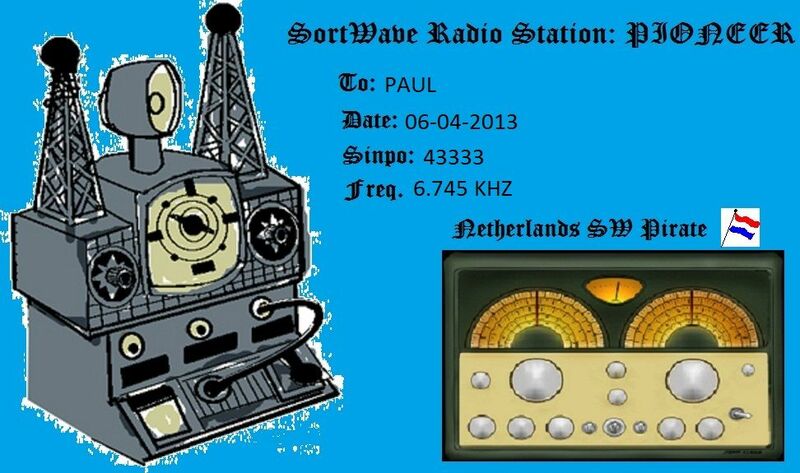 Nice To Hear This Station On SW Again. Just to let you know Geronimo Shortwave is on air on 31 mtrs via MV Baltic 9480khz this weekend Sunday the 14 th April. Start time is 11am CET following on after Atlantic 2000. Thanks Doc, for putting this notice out from your Web. There is a possibility that this time there will be a program from Dave Scott. Thanks Doc, keep up the good work that you do, and good listening. 6300-19.23 Unid With Dutch Music. Strong Signal Sinpo 54444. Closed Down Not Long After. 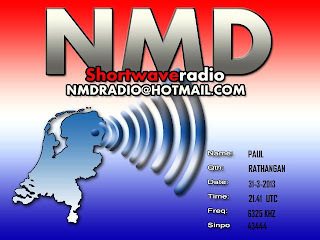 Laut einer eingegangenen E-Mail wird Radio Devalon am morgigen Sonntag, 07.04.2013 auf der 6206 oder 6240 KHZ aktiv sein. Der Sendestart soll um 08.30 UTC, bzw. 10.30 MESZ sein. Radio Devalon will be on air tomorrow morning, 07 of april 2013 on 6206 or 6240 KHZ. Time of Transmit is planned at 08.30 UTC / 10.30 MESZ. 6285-16.15 Unid With Dutch Music. Fair Signal Sinpo 43333. Closed Down Or Faded Out Few Minutes Later. 6290-16.35 Radio Telestar Playing"so long Marianne". Fading Out Not Long After. Sinpo 33333. 6210-17.55 Radio Klaubautemann. Weak Signal Sinpo 33222. Can Just Barely Here Some Music. 6291-19.28 Unid With Dance Music. Weak Signal Sinpo 33322.